When I first visited the ruins of Cowdray House at Midhurst, during the summer of 1973, its stark beauty immediately overcame me. Previous to my visit, I knew the house was a ruin and was reputed to have some sinister connections. From this I pictured a dark crumbling ruin of a small house, surrounded by trees and reached by a narrow dirt track. But when I got there I found I could not be more wrong. After walking along the long, stately entrance causeway from Midhurst, I was confronted by a majestic ruin, its stonework almost gold in the sun light. Once inside I found that the house was roughly square in plan with a large open court in the centre. 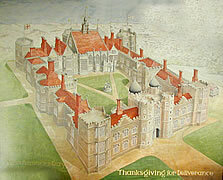 All that remained was the shell of the east range, which contained all the principle rooms and half the west front, including the great gatehouse at its centre. The ranges to the north and south had been reduced to their foundations. I felt immediately attached to the place. It was both awe-inspiring and friendly. I did not know its age at the time, but felt it to be of great antiquity. It was in a strange state of ruin, the remains seemed so perfect that the disastrous fire could almost have happened the previous day, though I later learnt it was nearly two centuries ago. Walking through he shattered rooms; I could see small details that survived the fire, like a piece of glass still in a window, or a charred wooden lintel over a door. In the chapel, high on the walls, were the remains of extensive plaster decorations, still surviving after years in the open. These details brought Cowdray back to life and I could almost see and hear the people of centuries ago talking and living in this great house. I pictured the stucco and the panelling that must have decorated the now bare walls. I could even imagine the sections of the house that no longer remained. Even in the short time I spend there, I was able to piece together the house and see it as a whole. When I left, I knew I had to return and find out more about the magnificent Cowdray House. It was about six months later that I found the first book on Cowdray. It was by Mrs. Charles Roundell and had the fitting title, Cowdray: The History of a Great English House published in 1884. Inside were some splendid illustrations of what the house had looked like inside and out, both before and after the fire and I was surprised to find it was similar to how I had imagined it. From the book I found that Cowdray had been built in the early sixteenth century and had been destroyed by fire in 1793, supposedly by a curse. It then remained derelict for over a century before it was cared for again. I knew I must pay another visit. In 1975 I made my second visit and went about the ruins using my newly found knowledge to correct my mental picture. I took more photographs to supplement those from first visit and when I left I even more inspired and longed to return again. I borrowed a copy of Mrs Roundell's book once more and took notes from it, so I would have a permanent record of the details of Cowdray, as I had a distant idea of one-day compiling my own history of Cowdray. When I had to find a subject for my 1977 thesis whist I was studying Design and Visual Communications at the West Sussex College of Design in 1977. I did not at first think of Cowdray. But after talks with my thesis tutor, Pat Vincent, she thought it would make a good subject, as I felt so strongly about it. I decided I would try and write a personal account of my view of Cowdray. To this end I made four further visits to Cowdray, made personal contacts with the Custodian, Mr Brounger, who very helpfully allowed me to have the freedom of the ruins during my research, I have taken nearly three hundred photographs and I have discovered a new authority on Cowdray, Sir William St.John Hope, who wrote a book in 1919, that far outranks Mrs. Roundell's account. This thesis tells what I have found out about Cowdray and tried to explain why I am so attracted to it.